Looking For A Great vacation Home? Check Out This New Listing Situated In Lake McGregor Nr Vulcan. This Home Is Situated In A Resort Like Setting And Is Located Just 1.5 Hours From South Calgary. Check Out 'Our Listings' On This Website and be sure to view the 3d virtual tour! 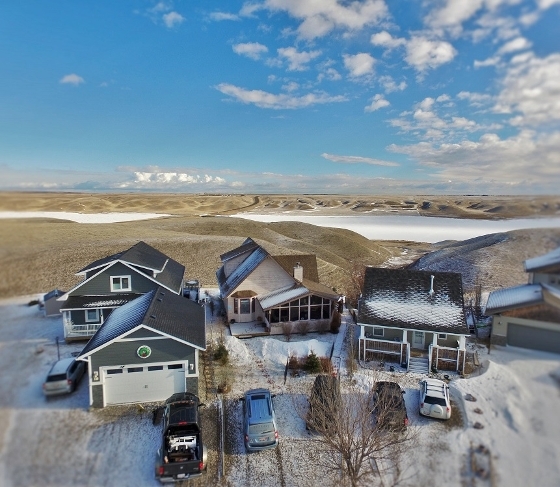 If you are looking for a lovely home or a great family vacation home then check out our new listing which is situated at Lake McGregor Estates near Vulcan. This is a lake communty which boasts a resort like setting, a community centre, swimming pools, tennis court, volleyball, basketball, baseball, golf driving range, playpark and of course the lovely McGregor Lake and its beach. Bring your boat and enjoy a great family get away or make your permanent home in this lovely resort. Your friends and family can bring their RV's and stay in the on site RV park. The property is lovely and the views from the deck are breathtaking. Check out this listing under the "Our Listings" section of this website. CHECK OUT THE 3D VIRTUAL TOUR! The views from this home (centre property) are absolutely incredible.....All this just 1.5 hours from South Calgary.